RCMP say shots were fired just before midnight. 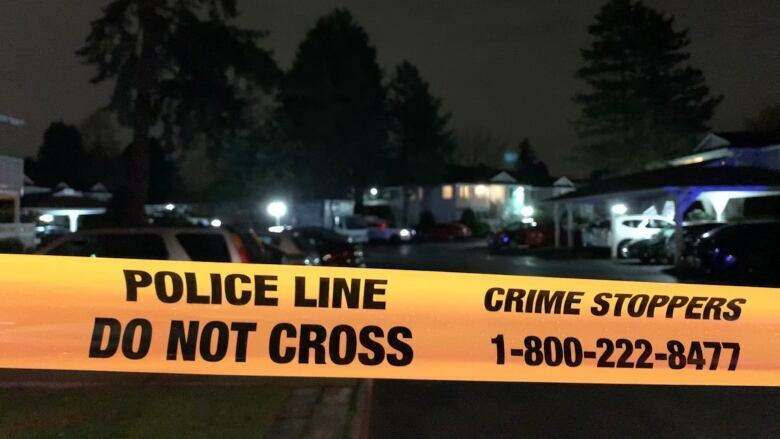 The man killed in a shooting at a townhouse complex in the Newton area of Surrey, B.C., late Tuesday night has been identified as 30-year-old Amrendra Vijay Kumar. RCMP said shots were fired in the 13900 block of 72 Avenue just before midnight. Responding officers found Kumar — a resident of the complex — outside with gunshot wounds. He later died at the scene. Kumar was a casual employee at Hollyburn Family Services, which provides support to children and youth with special needs. "We are shocked and saddened to hear of the passing of Amrendra Kumar," Hollyburn clinical director Chris Burt said in an email. "While we have no knowledge of the circumstances of his passing, we convey our condolences to his family." The Integrated Homicide Investigation Team is investigating. "We do not believe Mr. Kumar's shooting was a random act and our detectives are working hard to determine motive," Cpl. Frank Jang of IHIT said in a news release. "We need those who knew Mr. Kumar to come forward and help us piece together the circumstances leading up to his death." Jang said Kumar was not known to police and they haven't uncovered any links to gang conflict so far. Police said a vehicle sped away from the scene immediately after the shooting. A car fire happened 40 minutes later near 164 Street and 92 Avenue, and is believed to be related to the shooting.